.debug_names section consists of one or more units. Each unit starts with a header, which is followed by a list of compilation units, local and foreign type units. These may be followed by an (optional) hash lookup table, which consists of an array of buckets and hashes similar to the apple tables above. The only difference is that the hashes array is 1-based, and consequently an empty bucket is denoted by 0 and not UINT32_MAX. Next is the name table, which consists of an array of names and array of entry offsets. This is different from the apple tables, which store names next to the actual entries. The structure of the entries is described by an abbreviations table, which comes after the name table. Unlike the apple tables, which have a uniform entry structure described in the header, each .debug_names entry may have different index attributes (DW_IDX_???) attached to it. The last segment consists of a list of entries, which is a 0-terminated list referenced by the name table and interpreted with the help of the abbreviation table. Definition at line 224 of file DWARFAcceleratorTable.h. Definition at line 588 of file DWARFAcceleratorTable.h. Definition at line 578 of file DWARFAcceleratorTable.h. Definition at line 589 of file DWARFAcceleratorTable.h. Definition at line 774 of file DWARFAcceleratorTable.cpp. 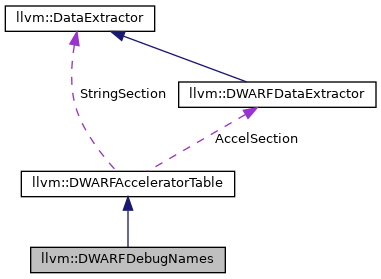 References llvm::caseFoldingDjbHash(), llvm::consumeError(), llvm::DWARFDebugNames::NameTableEntry::getEntryOffset(), llvm::DWARFDebugNames::NameTableEntry::getString(), llvm::None, and llvm::RISCVFenceField::W.
Definition at line 590 of file DWARFAcceleratorTable.h. Look up all entries in the accelerator table matching Key. Definition at line 872 of file DWARFAcceleratorTable.cpp. Definition at line 757 of file DWARFAcceleratorTable.cpp. References llvm::DWARFAcceleratorTable::AccelSection, E, llvm::DWARFDebugNames::NameIndex::extract(), llvm::DWARFDebugNames::NameIndex::getNextUnitOffset(), llvm::DataExtractor::isValidOffset(), and llvm::Error::success(). Return the Name Index covering the compile unit at CUOffset, or nullptr if there is no Name Index covering that unit. Definition at line 879 of file DWARFAcceleratorTable.cpp.